DWT is short for Douglas Wheel & Tire. 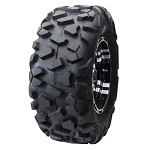 Douglas was one of the original frontrunners in the aftermarket ATV tire and wheel market. They originally specialized in parts for the sport racing quads. They are masters at making lightweight and durable tires and rims for high performance racing machines. In more recent years DWT has branched out into more styles and sizes for the growing Side x Side market. One of their many claims to fame is their Run Flat technology on some of their tires. So far they have released 3 tires that feature this new 12 ply run flat technology. The Moapa, Mojave & XCV3 tires. All 3 have been a huge success! Run flat tires have the ability to run without any air in them at all. Making it nearly impossible to get stranded while riding from a flat. If you somehow manage to puncture one of these amazing 12 ply tires you will still be able to drive on them to get you back to the trail head. We carry DWT's full line of quality tires and rims, check them out, if you aren't seeing what you are looking for just contact us and we'll find it for you.